Crispy Deviled Chicken & Potatoes - Recipe! - Live. Love. Laugh. Food. 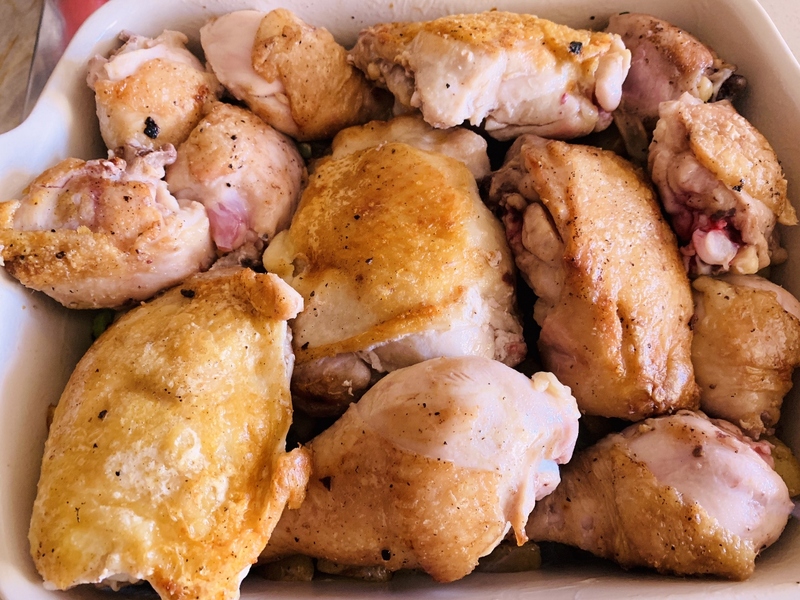 Everyone loves a good chicken recipe, so here is one recipe that has been around for ages, but with my own special twist. 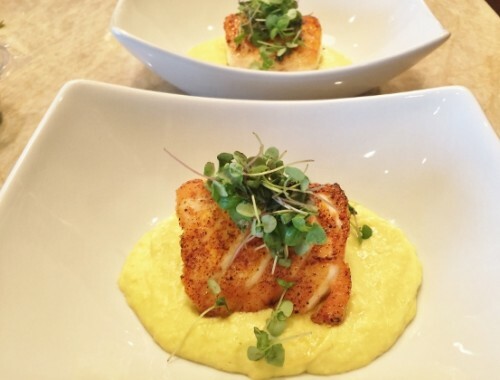 Deviled Chicken is a dish that can be prepared in many different ways, most of the recipes include a dab of Dijon mustard, but this is where the dish varies and so can your creativity. Cooking techniques differ in this dish and sometimes can be cumbersome; from grilling to broiling the bird first, to poaching it in a sauce. For me, I choose to make it a little more simple and cook all the ingredients in the same pan and layer the potatoes and chicken into a casserole dish after browning, and then spread the chicken with mustard. 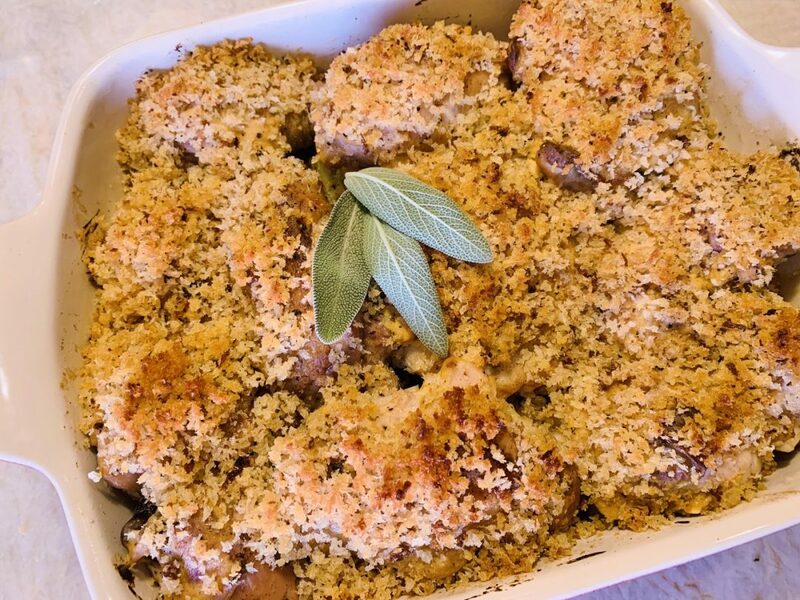 Before placing the casserole in the oven, I coat each piece of chicken with crispy breadcrumbs for a crunch that gets even better after baking. 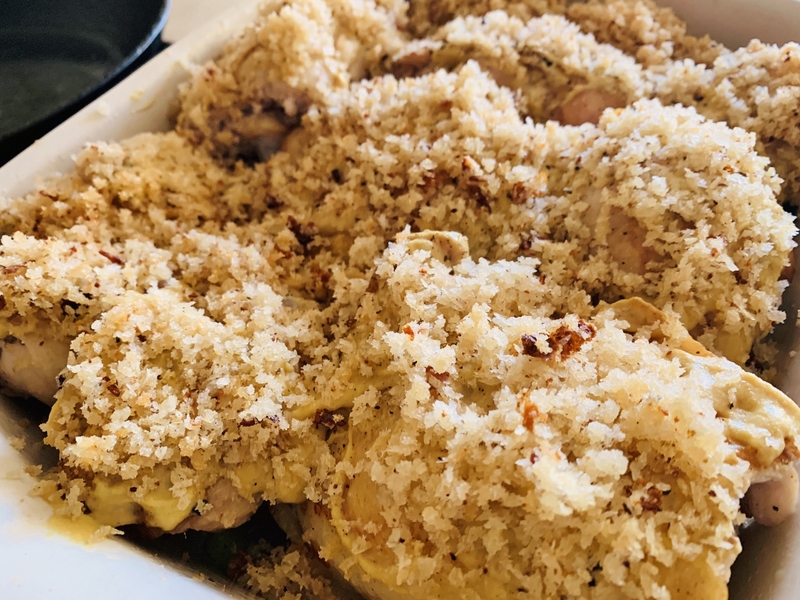 The outcome is tender and juicy chicken with a crispy crumb crust ladled over buttery potatoes – nothing wrong with that. 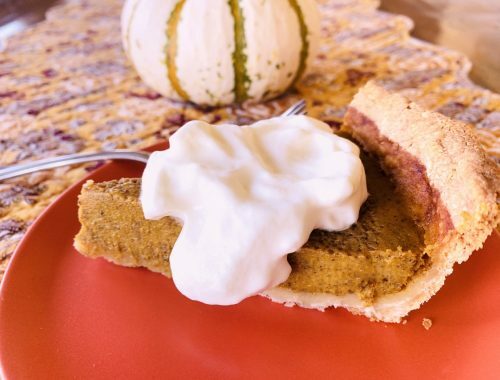 This is true comfort food and it’s nice to serve any day of the week, but especially on the weekends when you want a little more time to savor your meal – so invite some friends and enjoy a Social Sunday. Preheat oven to 400 degrees. In a large cast iron skillet add 1 tablespoon olive oil and place over medium-high heat. Add sliced potatoes to pan and stir. 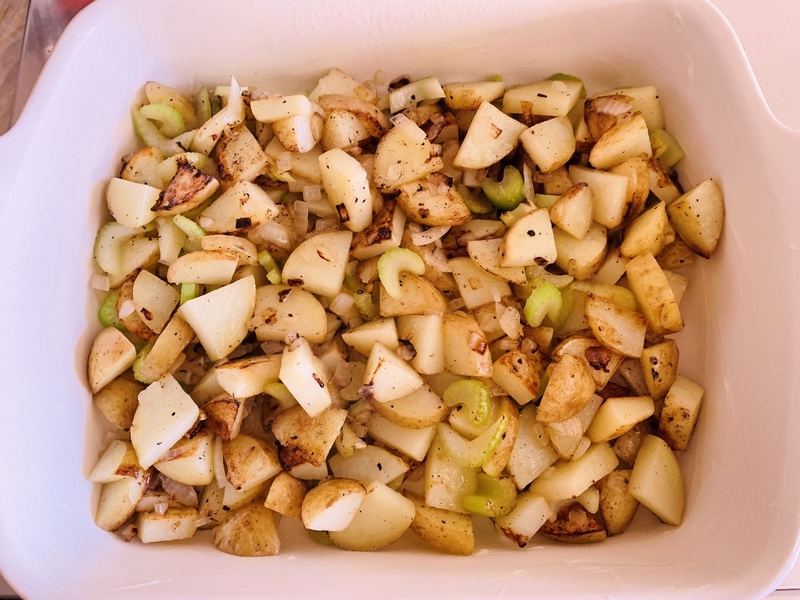 Season potatoes with 1 teaspoon salt and 1/2 teaspoon pepper and cook for 5 minutes, while occasionally stirring. Add onion and celery, continue to cook for 5 minutes. Pour potato mixture into a 2-quart casserole dish and sprinkle with sage, set aside. In same skillet, add 2 teaspoons oil and place over medium-high heat. Sprinkle chicken with salt and pepper and add pieces skin-side-down to skillet, cook for 4 minutes. Flip chicken over and continue to cook for 3 minutes. Remove chicken from skillet and place on top of potatoes in casserole. 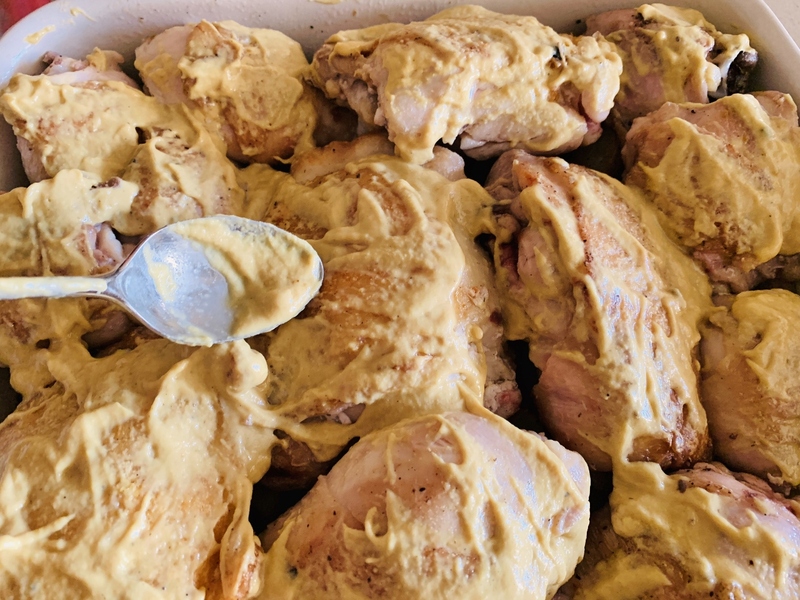 Spoon mustard over each chicken pieces. 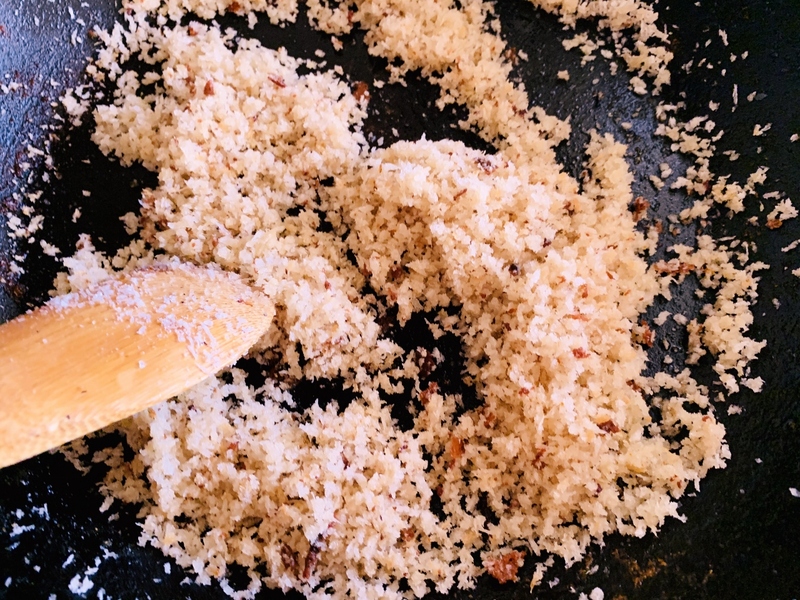 In skillet with remaining chicken juices, add panko and cook over medium heat until golden brown, about 2 minutes. Coat each piece of chicken with crumbs and cover casserole with foil. Place casserole in the oven and cook for 20 minutes, remove foil and continue to cook for 25 minutes. If crumbs are getting too brown, cover with foil. 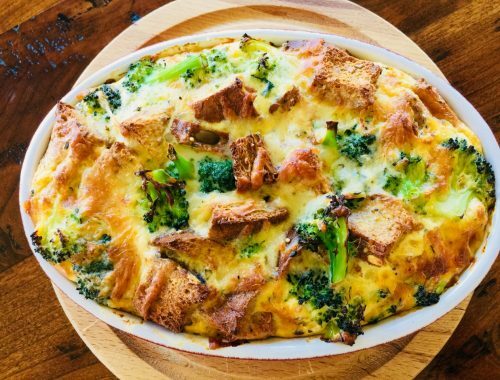 Remove casserole from oven and let rest 5 minutes before serving. Spoon chicken onto plates with potatoes. Enjoy!